Roman children tremble in their beds as their mothers tell them stories of Medusa, the Hundred-Handed Ones, and the War of the Titans. They pray that the Fates have woven a long skein for them, free from encounters with the Minotaur and Cerberus. Little do they know that things more horrible than the creatures of myth and legend inhabit the world. 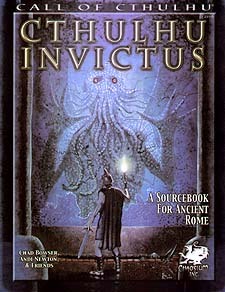 This is the world of Cthulhu Invictus, a horror roleplaying supplement for Call of Cthulhu set in the first century CE, the time of the Roman Empire.